I was planning to run Hyperion and the Arcantric Force Generator however I left the AFG at a friends place so went with this alternate list. I like Dahlia Hallyr and Skarath and the anti living tech they bring to the table, Skarath is also a solid beast on its own. The skinwalkers getting 2 attacks each at mat 8 with the UA and Carnivore now are a real big threat. I was thinking to either shoot them away or get the sprays down on them. Overall I figured Morvahna was failry wek to ranged assassination and planned to use the feat turn to put as much damage on her to either kill her, hurt her beasts and or make it hard for her to feat effectively. 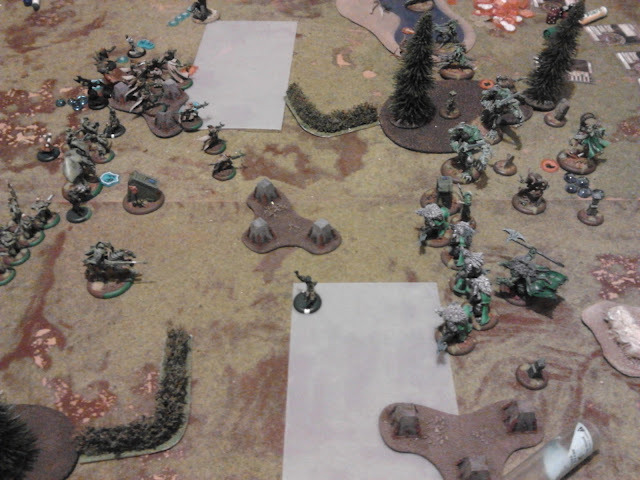 My first turn the Strike Force bunched up around the artificer for defense as they were preyed by the Wolf Riders. With snipe I landed several shots and manged to kill 2 wolf riders. The Mage Hunter Assassin out the front charged a Gallows Grove and removed it from the table. Unfortunately in his counter turn the Skinwalkers engaged the strike force, even without their +2 bonus speed, and made the full unit fail its command check, the remaining wolf riders just assaulted, killed a few and engaged more with light cav moves. Even without the Strike Force I quickly assessed assassination potential. If I was able to clear one skinwalker with say, Ravyn, Discordia, a Mage Hunter Assassin and potentially an Artificer I can get the full unit of Invictors + the Destor Thane under Ravyns feat to fire on Morvahna, camping 5 transfers, that's 5 combines and potentially 5 more rat 7 3d6 power 12 damage at d-3 shots.... seemed good. The mage hunter assassin missed, Discordia failed to damage it, I left the Assassin too close so when Ravyn moved in and feated she also failed to kill it. I went with the Thane anyway and couldnt clear the hedge while staying inside feat range, so he couldn't contribute. Considering what was going to happen next turn I went on with shooting Morvahna to soften up the beasts, because with Fog of War up they were perma stealth. With snipe and the mini feat Extended Fire on the Invictors I tagged Morvahna for about 10 damage and made her transfer 4 times. 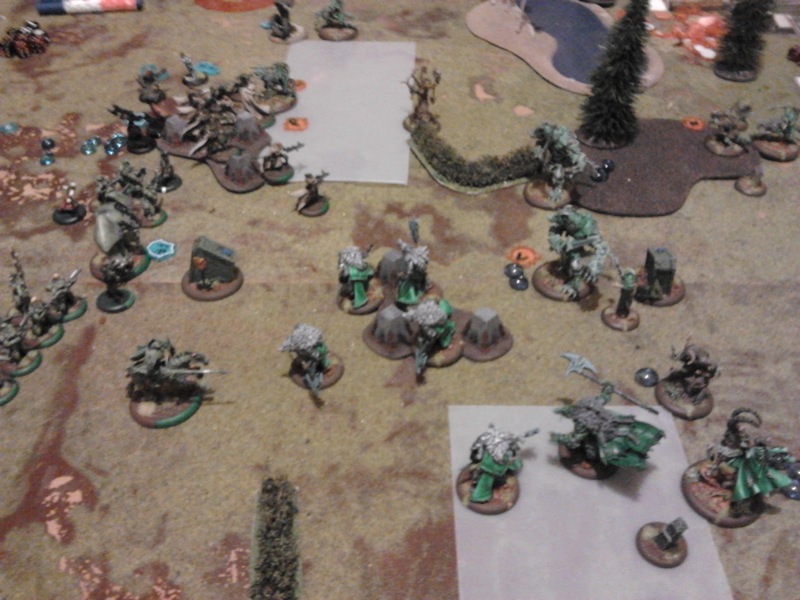 So the next turn the stalkers come in, wreck Discordia and take a chunk out of the strike force, the Skinwalkers also come in and kill most of the Invictors and Carnivore heals up Morvahna. He has left however both of his stalkers in reach range of Ravyn. The Strike Force rally, now that half of them are dead. Ravyn steps up and threshers the Stalkers and starts going Gun Foo on them, she kills one and leaves the other on about 10 boxes. The strike force step in and leave it on one box, phenomenally bad dice rolls. Skarath charges accross and boosts and attack, and fails to hit, buys and boosts again and fails again. So the Magister which was killing and pushing around WolF Riders slams Skarath over the Strike Force engaging the Stalker and into the Stalker, killing Skarath and Killing the Stalker and killing about 3 strike force. Cool move but not what I wanted to really do. Morvahna responds by feating and throwing more stuff into the zone. At this point he is on about 3 control points and I have 2. If I could have run Dahlia into the Zone to control and used Ravyn to clear the friendly zone to Dominate I would win, but I pointed out that after I killed Skarath and the rest of the strike force had melted he actually scored a point and took the win on scenario by simply ending his turn. Failing command checks on Strike force with Ravyn before you Feat is super lame. Emorv is pretty neat but I don't think she is super sweet, Will Pagani won a tournament with her and with pretty much this same list. He is Will Pagani, I remember him winning this time last year by warpathing a Gnarl Horn and killing Thyra. I think he is just good at applying strategy and tactics quickly to get ahead of his opponents, and EMorv would have been a nice example of a Curve-ball new caster in the hands of a very skilled player. He can also write some semi decent lists and apply them well without much practice. I mentioned to my opponent that being aware I cant attrition that battle I would be going straight for assassination and a 15/15 caster on a large base that is want to cut herself is a pretty good target, however he seems adamant that he can keep her safe. We will see in future games.